Roadways that our forefathers depended on for their livelihood, including Longling Historic Trail, Caoling Historic Trail, and Paoma Historic Trail, have now become popular hiking trails. Though these are the very same roads, the air surrounding them has changed completely. Yilan's history is full of stories of how the people overcame natural barriers to make Yilan less isolated and more accessible to the rest of Taiwan. But just how isolated was Yilan? About five million years ago before the dawn of history, the Philippine Sea Plate rammed northwestward into the Eurasian Plate and the place that we call Taiwan today rose from the bottom of the ocean. The initial collision took place approximately where Nan'ao is today. As a result, the region between Nan'ao and Hualien is the oldest layer of rock in Taiwan. Lanyang Plain might have been only a steep mountain or a small depression in the mountains at the time. With the Xueshan Mountain Range to the west and the Central Mountain Range to the south, the Lanyang River flowed from between the two mountain ranges. While the Okinawa Trough opened and stretched towards the southwest, the depression continued to expand and the Lanyang River carried rock down from the mountains. Millions of years finally gave birth to Lanyang Delta Plain, which drops more than 1,000 kilometers in vertical depth and covers more than 300 square kilometers in area. 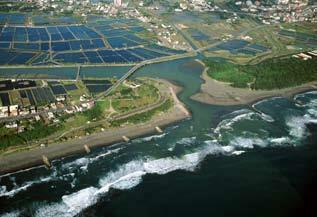 Yilan is situated at northeastern of Taiwan. It covers an area of 2,143 square kilometers. The longest distance in the east-west direction is 63 kilometers and 74 kilometers in the north-south direction. The region is in a rough triangular shape. It is surrounded by mountains on three sides, the Xueshan Mountain Range and the Central Mountain Range in the north, the west, and the south. Only the east side faces out to the Pacific Ocean. The Lanyang River pierces through between the two mountain ranges to create the Lanyang Plain. The land falls in altitude from west to east in stages of mountains, alleys, piedmont alluvial plains, lowlands, swamps, sand hills, and finally coastlines.